Mold Testing & Remediation is a topic that homeowners in Nashville, Brentwood, Franklin and all of Middle Tennessee have told us over and over, there’s nothing worse than finding mold or mildew on their property. Mold is the cause of several diseases, including asthma, allergies, fever, hay fever and many more. If mold is not professionally treated with proven mold remediation techniques when it is first discovered, it will continue to spread through the home, causing expensive damage to the property. Franklin Environmental Services is certified by the Professional Mold Institute for testing and remediation (removal) of mold. We use an EPA-registered antimicrobial coating designed to kill residual mold and mildew remaining after pre-cleaning contaminated surfaces. 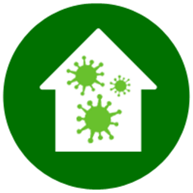 It also inhibits the future growth and spread of mold and mildew. We treat interior wall surfaces such as plaster, wallboard, drywall, concrete, masonry block, wood, primed metal and galvanized metal as well as interior wood framing, primed metal, concrete, and wallboard inside the wall cavity. If you suspect your house or property is contaminated with mold or mildew, we’ll be happy to provide an effective mold testing and remediation solution in Franklin, Nashville, Murfreesboro or nearby areas. Please contact our team today! You can even call us at (615) 364-8354 for a FREE visual inspection.